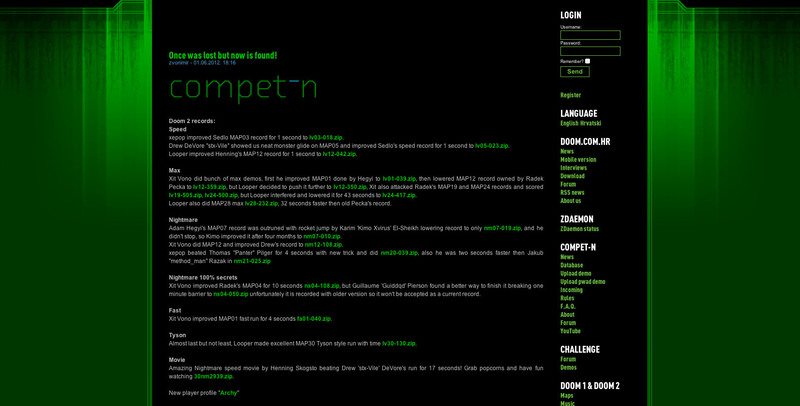 In this topic we'll cover all updates done to doom.com.hr / COMPET-N.
- fixed all doom 2 pacifist downloads and comments -> from IRC "dingir: fx02: Some download links from the Doom2 UV Pacifist compet-n database web frontend at doom.com.hr don't work (lv14-020, lv16-011, lv18-021, maybe more where UV Speed = UV Pacifist)." - old CN forum is now finally working! - comments page will show you demo TXT if you hover "download"
- MM speed done, vdgg finished Requiem Max, I wonder when did AdamH found time to play, last few months I played only few hours just to get back in shape and make one demo... Well, the end of database filling is near! That's sweet smell of victory! - totaly new COMPET-N theme is almost finished, needs few more fixes but it will be applied soon, thank you Q! 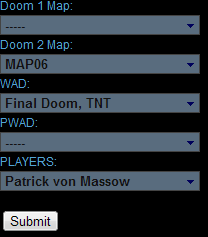 - more work on database interface for moderators/admins: http://doom.com.hr/db/ -> COMPET-N moderators needed! - example of database output: http://doom.com.hr/baza/list.php - not working anymore! - finished adding all demos! YAY! - Archy started work on Plutonia demos!!! - WIP for Compet-n page by Alen 'Q' Stojanac: http://doom.com.hr/images/wip/dc1.jpg and http://doom.com.hr/images/wip/dc2.jpg. If there is anyone who would like to create new style for doom.com.hr/COMPET-N/Challange let me know, I'll be glad to send PS files. - edited COMPET-N logo since I don't have original source for COMPET-N logo, anyone? Last edited by fx on 24.11.2015 23:03, edited 140 times in total. zvonimir wrote: - edited Compet-n logo since I don't have original source for Compet-n logo, anyone? I don't think there is a "source for Compet-n logo" without the background. Just to let you know that I'm working hard on new database, take a look at first post. I want to have it done this month so everything will be smooth and slick. Also I'll need database maintainers, so if you are interested please send me PM or reply here. 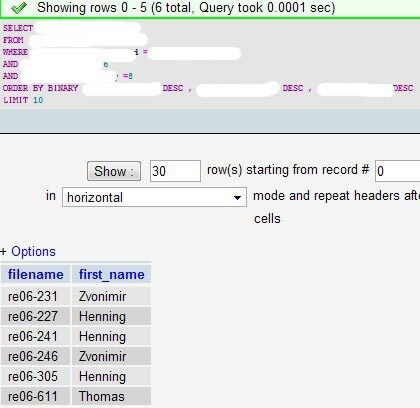 And by that I mean I need people that will fix errors in database or add new records for wads/pwads or new players in database via simple webpage with few clicks. I think vdgg deserves a better title than "noob." This addition can be somewhat annoying when viewing the database, as when clicking from link to link, one must scroll down afterwords to see the desired content. Other than that though, I like it. Probably tommorow, then you can suit it to your needs. Need to rework those options so they will be bond to forum username and not to computer/browser as they are now using cookies. So if you visit the page from another pc with your username, your settings will apply automatically. Almost everything can be altered now. Cheers! Edit: Never mind, figured it out. Sometimes changes are not visible until you refresh the page. Not sure why, I'll figure it one day, hehe. Gallery gave me serious problems (look at CPU usage) yesterday so it was disabled for some time until I fixed the problem. Subsilver style needs fixes and I consider it unusable for now.